Hugo Award Finalist: A near-future novel of artificial intelligence, human nature, and mass murder that “succeeds on virtually every level” (The New York Times Book Review). In Los Angeles in 2047, advances in the science of psychology have made crime a rare occurrence. So it’s utterly shocking when eight bodies are detected in an apartment, and not long afterward the perpetrator is revealed as well: noted poet Emmanuel Goldsmith. The LAPD’s Mary Choy—who has had both her appearance and her police work enhanced by nanotechnology—is tasked with arresting the killer, while psychotherapy pioneer Martin Burke prepares to explore his mind. Meanwhile, Goldsmith’s good friend and fellow writer reels at the news—while, far from all of them, a space probe makes a startling discovery. 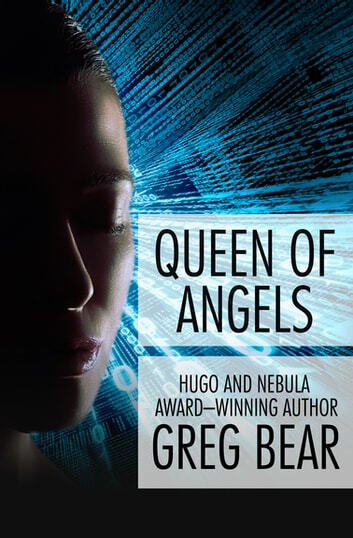 This “excellent” novel about technology, identity, and the nature of consciousness is a thought-provoking stunner by the Nebula Award–winning author of the Eon series and the Forerunner Saga (Chicago Tribune). Als je enige interesse hebt voor wetenschappelijk geschreven science fiction, en dan vooral op technologisch gebied, is Greg Bear een must read. Queen of Angels duikt in de ethische vraagstukken die gepaard gaan met de ontwikkelingen die bewustzijn manipuleren en zelfs fabriceren. Een meesterijk eerste deel. My favorite book of all times. It actually is (at least) three stories in one. I love how the different story threads develop and support each other.